Some of the NDE prayer-actions at Creech Air Force Base lead to court cases. 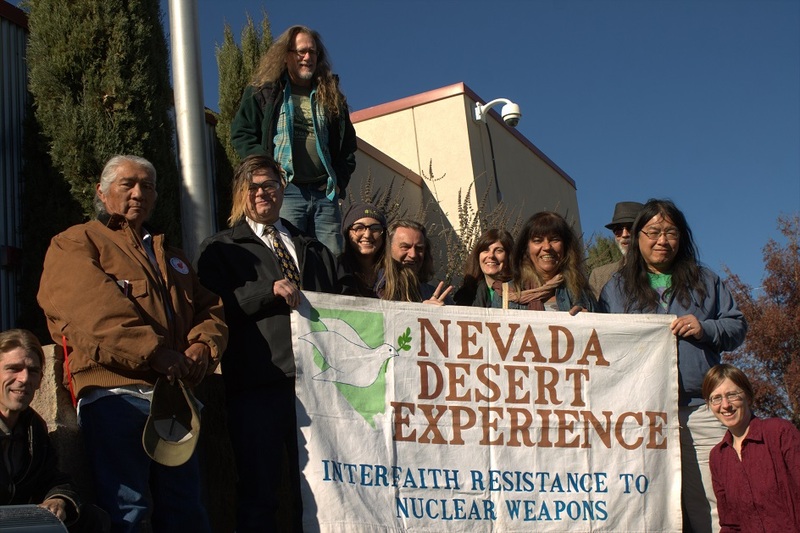 More rarely have NDE prayer-actions at the nuclear site led to court cases. The legal consequences from public witness at the NNSS usually didn't include court cases from 1987 through 2018, presumably due to the de-facto honoring of the Treaty of Ruby Valley. 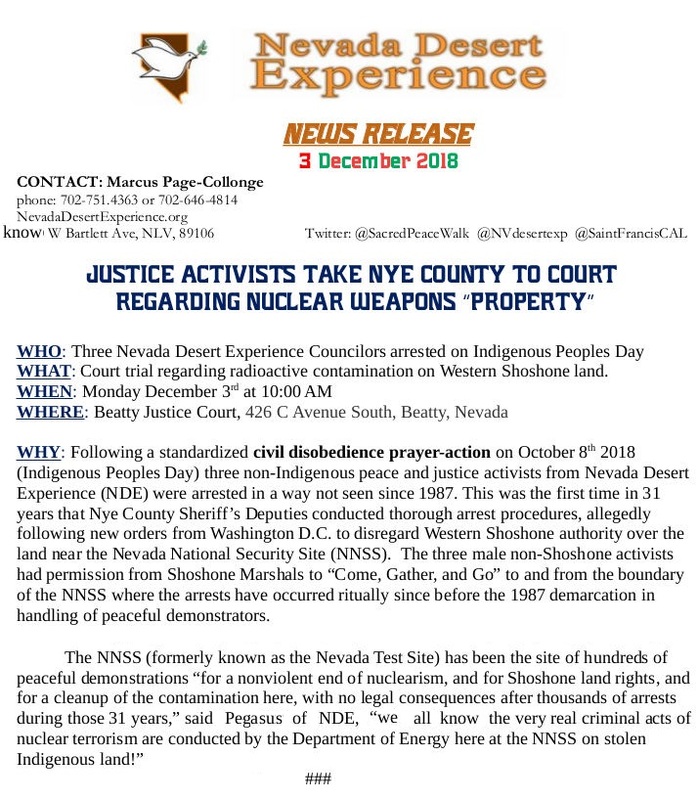 The typical legal defense is the reality of the Western Shoshone Nation's jurisdiction over the territory where the NNSS is situated, therefore permission for non-Shoshones constitutes no trespassing (the NNSS is unlawfully operated on stolen Native Land.) The Nuclear Resister has more to say about this history. 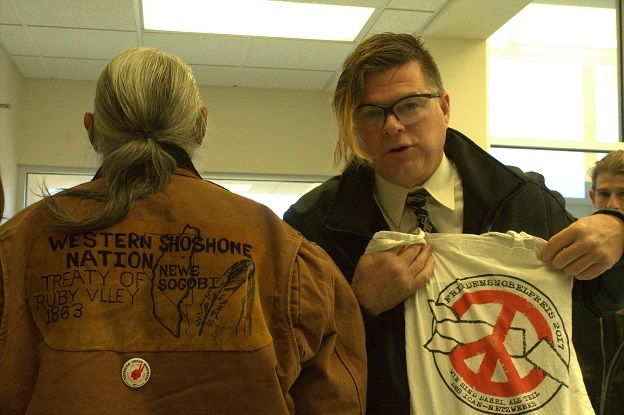 Johnnie Bobb shows off his Western Shoshone jacket while Pegasus shows off his German satchel for nuclear abolition. 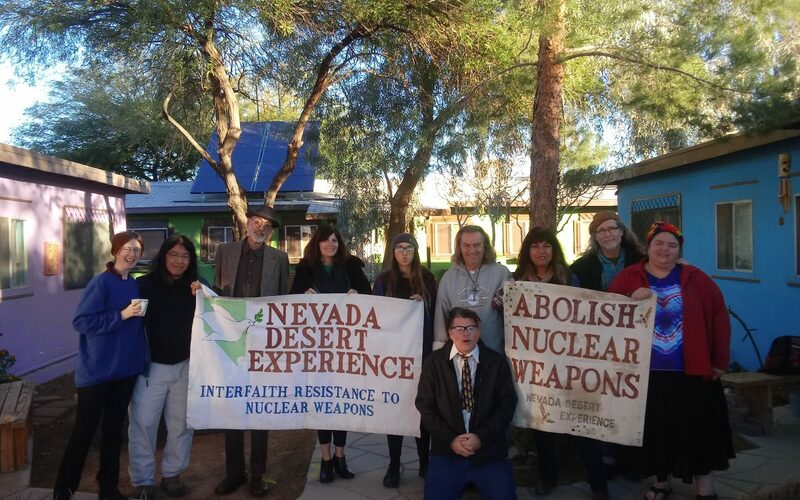 While waiting for courtroom clerical protocols to be complete, the NDE volunteers and Shoshone supporters had a minute to grab some selfies at Beatty, Nevada. Be advised that this web page is often at least 24 hours behind (we are a nonprofit faith-based action group, on a shoestring budget, with an all-volunteer part-time media department. Friends gather for the historic resumption of court cases for NNSS alleged "trespassers." In the case of Nevada Vs. Marcus Pegasus (#18 CR 00064) where Mr. Pegasus was charged with NRS 207.200 (a misdemeanor trespassing idea), the court session lasted over an hour in Beatty, Nevada. 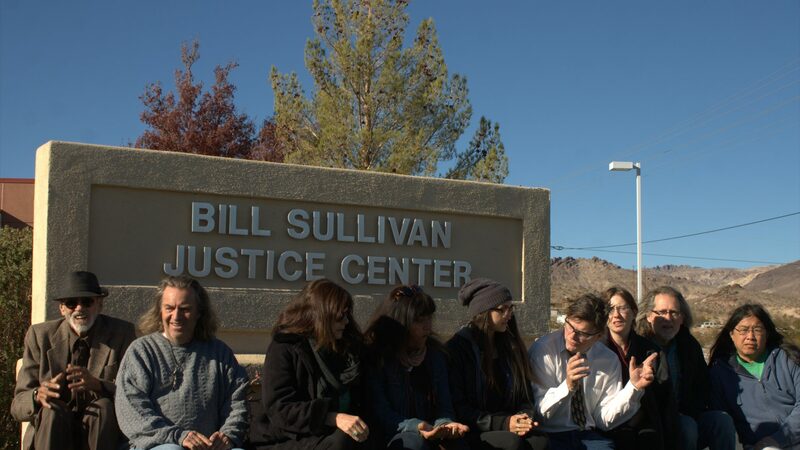 Deputy DA Dworin argued the case in front of Justice of the Peace Gus Sullivan (son of Bill Sullivan who presided over hundreds of cases of peaceful demonstrators and nonviolent activists in the 1980s). Pegasus told Sullivan that the State utterly failed to provide any evidence of title to the land in question. Pegasus demonstrated (with the testimony of Shoshone Chief Johnnie Bobb) years of permission have been granted by the proper Shoshone authorities to non-Shoshones to be present for the sake of peace and justice at "the Southern Zone of the Western Shoshone Nation" (a.k.a. the NNSS). In the end, the State won their case (how'd they do that with no evidence of ownership to that land? ), meaning Marcus Pegasus was found guilty and immediately sentenced to a $200 fine, payable within 30 calendar days, with a $105 mandatory court fee (even if the $200 is worked off via community service). Refusal to pay would allegedly lead to 25 days in jail, with further court fees still unavoidable, according to Sullivan when questioned by Pegasus.